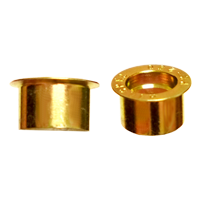 There are two basic types of grommets for the 4000 series C-Spec fasteners and they go though the outer panel only. Measure the thickness of the outer panel and select the shortest grommet that will fit it. 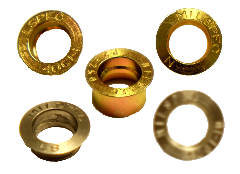 Snap Ring retained grommets are the most common, least expensive, are reusable and have many size and style options. They will protrude slightly from the back side of the outer panel. 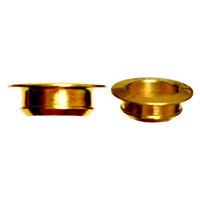 This protrusion of the grommet is absorbed by the inner panel, support structure, receptacle or a combination of these. Therefore, no gap will exist between panels. 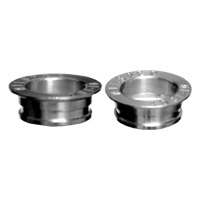 Flare retained grommets are permanently crimped into the outer panel with specific tooling (see tools section). They are recommended for panels subject to severe vibration, are not reusable and somewhat limited in configurations and materials. 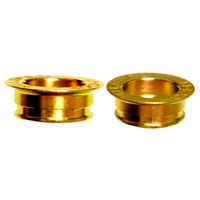 Once you have clicked your basic preference below, a new page will open where you can choose grommets of various lengths and styles (flush, low profile, large flange etc). Some reference information to help determine the proper grommet is listed at the bottom of each page. If you have any questions or need technical assistance, please Contact Us, we will be glad to help. 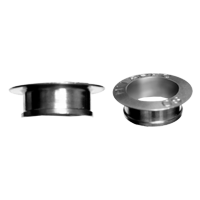 DFARS Compliant Stainless Steel with a Bright and Shiny, Passivated Finish as per AMS2700.